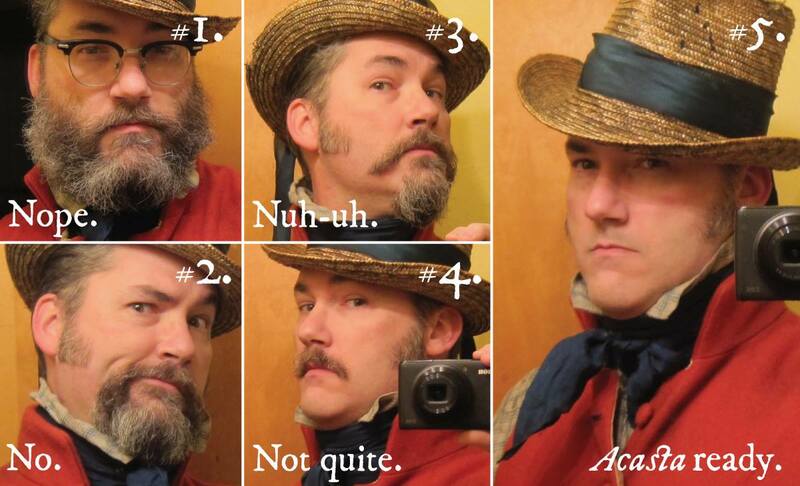 Looking for ways to improve your reenactor-game? Here are some easy suggestions that can help you do just that! Everyone should do research into their clothing and gear. What you wear and why you wear it. Get your primary and secondary sources together, images, links, etc. Then put them all online somewhere like a Facebook Album or a Pinterst board so that you can show them off. If anyone questions what you have on or your gear, you have your research all gathered and ready to show off. ‘Plateau-ing’ is something I’ve noticed with a lot of reenactors, they reach a certain point in their interpretation and they just stop like this is the 100 meter dash. They want to research really fast to get to the ‘end’ so they can be ‘done’. I’ve got news for you kids, you’re never going to be ‘done’ researching and improving. There’s always more to learn, more to discover. New things are being found all the time, sometimes they serve to confirm what you’re doing and sometimes they will challenge or even prove what you’re doing is wrong… but history isn’t a 100 yard dash for a finish line so that you can go rest and never research again. I know, first hand, how tempting it can be to want to copy something cool you've seen in your favorite period-movie. Because we never know where or even IF the costumes designers have done their research, it’s not safe to copy movie/tv costumes. Not even if the program was produced for the BBC. Not even if it’s your favorite movie of all time. Instead, the proper way to make use of movie/tv costumes is to use them for inspiration… use them to fuel your own research based on primary and secondary sources. There’s no shame in representing the societal norms for the era you portray. When everyone at the event is the historical oddity or representing something rarely seen… then the public can get the wrong idea of what MOST of your era looked like. “Nullius in verba”, is Latin for "Take nobody's word for it". You don't have to have everything written out in MLA format, but if you can’t tell me what primary and secondary books and images you’ve taken your impression from, I’m going to be VERY skeptical about your impression. I would see your research sir! These are the big three things that will kill you impression the fastest. Facial hair differs from era to era, so make sure to do your homework and find out what's appropriate and what's not for the time-period you're doing. If you need glasses, consider getting period correct frames, contacts, or just going without if you can. Not long ago, I spotted a friend's images from a recent historical reenactment they attended where the participants ran rampant with inappropriate facial hair, modern shoes and glasses, clothes made and/or worn wrong by men AND women. Their camps were filled with modern camping gear and camp furniture. The event looked like a train wreck, full of modern anachronisms, showing the worst sort of ‘historical reenactment’. I shudder to think what kind of ‘knowledge’ the public walks away from an event like that with. In my frustration, I asked the fateful question, “What the hell are they doing?”. Do they care that they’re perpetrating false history? Are they aware that they’re making themselves and the event look bad? Are they lazy? Are they just camping in funny clothing? I know they KNOW better, so why didn’t they DO better? I’ve said it before, I'm a firm believer in research… and in theory ALL historical interpreters/re-enactors should be. It's the MOST important tool we have in our arsenal for showing the public what life was like in the past. Because, at the end of the day we're supposed to be displaying and depicting correct history, or at least as correct as we can make it… right? It is OUR job as historical interpreters/re-enactors to be as historically accurate as we can for the public. Do you have any easy suggestions for reeanactors to improve their impressions? Please feel free to share them in the COMMENTS section below, we'd love to hear your ideas! Interested in having a look at some of our other reenactor lists? The most AWESOME things about being a Reenactor! If you have enjoyed reading this or the other adventures of HMS Acasta, be certain to become an honorary member of the crew. This is a easy way to show us that you're out there and paying attention. If you find a post that you are particularly fond of... be sure to share a link with your friends, over Facebook, Tumblr, Google Plus, etc. so they can enjoy it too! The Acasta log is generally updated every weekday by 8am CST, visit back often, and encourage your History Nerd/Reenacting/Royal Navy friends to visit us.